Bite Size Amanda – Magic Bus | "Just walk with me.."
This entry was posted in Season One, SMK Bite Size. Bookmark the permalink. BJo mentioned to me on email she’s travelling at the moment.. so she won’t get to respond to our comments on her post for a bit..
Hi Jule! I am glad that you have your priorities in order 😉 And I’m sure Lee and Amanda would agree with you 🙂 Congrats on your stepdaughter’s nuptials! I’m glad you enjoy this little post about Amanda – she really has come a long way. It makes for an interesting comparison to where she is now with the job and with Lee in TWWHome. I think this tag is one of my favorites for season 1. Amanda comes across as very competent and confident, much to Lee’s surprise and Francine’s chagrin. Yay! It’s funny how there was a transformation of Amanda in this episode, but I really like Lee’s transformation regarding Amanda. He starts off being pretty jerky, but has to change his tune several times in this episode. I love the up and down look he gives Amanda when he realizes that she was able to accomplish something he wasn’t able to do and then she invites him along. She takes care of him instead of leaving him behind and he is grateful for it, she drives the Vigilant like a champ and then finally bandages him up. I’m so glad he even acknowledged to Francine that Amanda did the driving. She starts to gain some confidence and develops a bit of a backbone in this episode. 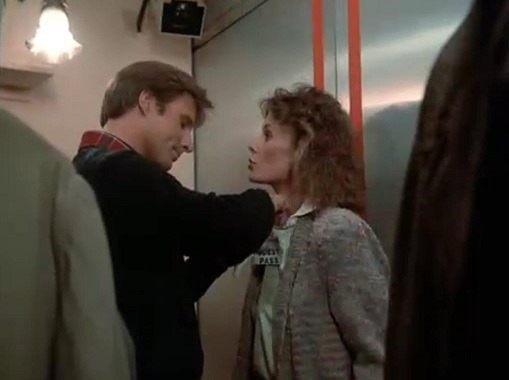 I like how she stands up to Lee in the elevator. She is the one who got the invite and should go. And I like how at the end she does tell him he’s being petty. I think that Amanda is still getting used to how everything works at the Agency and some of the things she is asked to do or has seen probably all still seems a bit unreal to her. What she has been doing in regards to her helping out at the Agency and the people she is dealing with has probably been pretty surreal. So reminding Lee that real people live in her house is probably a reminder to herself as well as to what is real and what isn’t. She probably equates it with normalcy and that Lee’s realm of reality and hers are quite different. I thinks it’s also another way in which she is attempting to teach him some manners. Not too sure about the wine. It was around this time that Mothers Against Drunk Driving was starting to grow and become more popular. Maybe the wine was meant to be as part of a celebration once they got the Vigilant where it was supposed to go. A bottle between two people would probably be at most two glasses each. I like your thoughts on what is real, Valerie. At this stage, the Agency, Lee and the life of an ‘intelligence agent’ are still not real, almost part of her fantasy life. It was completely unintentional to publish this magic bus revisit now – while we are walking through the wrong way home – but it is fascinating to be reminded of how far Amanda has come.. and fits in nicely with the whole idea that Joe doesn’t know Amanda so well anymore.. and maybe it’s a great chance for Amanda to see how far she has come also- well done Amanda! Oh and how about how far Lee has come?! from Magic bus to wrong way home? huge changes! and Lee has grown so much- well done Lee! Huge thanks to BJo for writing this post for us – and sorry I sat on it for so long!!! It was a luxury to have this post to fall back on should I need it- thank you!!! If you’d like to write post – go for it.. you can do it how you like and make it your own – we all have a different voice a different slant on things – fun, analytical, mathematical, quirky, silly, narky, philosophical, intellectual.. anymore? I’m sure the descriptors are endless.. Thanks everyone for your patience while I’ve been delayed in continuing our walk – I really appreciate it and value this walk with you all.. I’ve missed it!!! A new Wrong way home post will be published (my time) tomorrow.. but it’s going to still be a rather slow walk for now I’m afraid.. but at least it will be in the right direction! Hi valeriejw! Really like your comment! There definitely seems to be transformation of both Lee and Amanda in this episode. I think my favorite part of the episode is when Lee gives her that up and down look you mention. I laugh out loud every time I see it. He doesn’t even try to hide his contempt when he realizes that Amanda achieved his objective apparently without any effort while he was doing all he could. It totally irks him and I love how Amanda is just so blasé about it. I think she is doing that on purpose. She’s acting like it was no big deal and it was easy to do – hahaha – Love it! Oh wow — those fashionable headbands! I was never bothered by the addition of wine to the picnic basket though thinking about it, it seems kind of random. Maybe it was Amanda’s subconscious that made her do it (wishing for a quiet picnic lunch that lasted hours so a glass of wine would have been properly digested and neutralized before anyone got behind the wheel of the RV. Love the thought of Amanda’s subconscious being the one responsible for putting that bottle of wine in the picnic basket for Lee! That does sound like an S1 fantasy Amanda would have about a secret agent. It’s very strange to watch Lee and Amanda early in season 1 after being so much “inside” season 3. And difficult to see some ditzy Amanda early in this episode. She does toughen up nicely and put Lee in his place by mid-episode. Maybe some of her ditziness is lack of confidence in herself at the beginning of the episode. And as she gained some confidence through the episode (especially after being invited to the Survivors weekend, coping with the physical activities, rescuing Lee and driving the Vigilant), she became more assertive. I relate to that. Also to losing confidence pretty quickly when I’m heavily criticised (as Amanda does again and again in subsequent season 1 and even season 2 episodes). Why does Amanda pack Lee a picnic lunch: I think it’s part her nurturing personality, and partly SMK stereotyping a housewife with 2 boys 😦 . As for the wine – well this was the 80s. Some mainstream GPs were recommending that people drink wine for their health. And the classic drink driving study was only 19 years before this episode aired. Would be interesting to know from JWWM’ers who were older at the time this episode aired how drink-driving was viewed by the general population in the early 1980s. Amanda: Oh. Well, you know, I think I’ll just get another ball and . . . couldn’t I just play it from here? Emma: Amanda, that’s cheating. Do you want to cheat? I always wonder what the actor playing the “Weasel-Faced Man” must have thought when he got the part. “Yippee, I get to play . . . a ‘weasel-faced man’ . . . do I really look like a weasel?” Or maybe he was enthusiastic? “Weasel-faced! I could totally play that!” I don’t know. I’m just not seeing it. Horrible thought – wearing a suit every day doesn’t tend to help the colour or hair coverage of a man’s legs:o . And those red/white socks are bad. I like that Amanda sticks by her assessment. And that she refuses to flatter Lee’s rather inflated ego (regarding his appearance). I like your comment about Lee’s inflated ego. I think that’s one of the things early on that makes Amanda stand out from what Lee is used to. He is used to women fawning over him and letting him get away with stuff, like his blatant “suave and debonair” tuxedo attempt in TFT. Amanda steels herself against what he thinks are his obvious charms and refuses to take the bait. And at the same time takes him down a peg or two. I agree, valeriejw – and I also think it is one of Amanda’s qualities that Lee finds intriguing. At first he tries to treat Amanda like he does other women. I wonder if he thinks that because she is just a suburban housewife that she couldn’t possibly resist his charms. Amanda’s resistance to Lee’s charms and her letting him know is part of what makes early S1 so good to watch. You have a point. It is difficult to get/maintain a tan with suits. I agree, learjet – those old tube socks of Lee’s are bad. And his legs are nice, but not his best feature in my mind, so I am glad too that she sticks with her assessment because I think it’s the truth 🙂 Magnum had better legs for sure and I don’t think he wore such dreadful socks, but Lee does win IMO in the dressing category over him – easily. Jestress your last part of your comment? sounds just like my boss! grrr.. I knew it! Ulterior motives! Hahaha – love your weasel-faced man comment! I wonder how many other weasel-faced characters he got to play? His career was probably ruined after this – leading man roles – no need to apply! I think he does look a little weasel-y. I think in the episode post iwsod even put a picture of a weasel in there to compare him to. I think you make some great points about how Amanda’s confidence can get shaken by the repeated put-downs and criticisms she receives in S1. I find it pretty amazing that she never gives up on herself – she seems to have an unshakable faith or belief in herself. I wish I had that. I’m glad you brought up that cheating comment by Amanda in the episode. It does seem surprising at first, but when I think about it, maybe not. I get the feeling that even though Amanda is in shape, she doesn’t much like the game of golf nor is she very good at it. Mini-golf maybe, but not the real thing. Despite having a cart to drive, golf courses are long, and even 9 holes of par-3 golf can take a long time. I’ve tried real golf a few times and I find it painful. I’m not very good at it and I find it dreadfully boring to play. I am normally a strict rule follower, but a long, painful round of golf could turn me into a cheater too just to get off the course faster. I also think she may find the Standishes to be very boring people. Dotty seems like she is much more fun than Mrs. Standish.